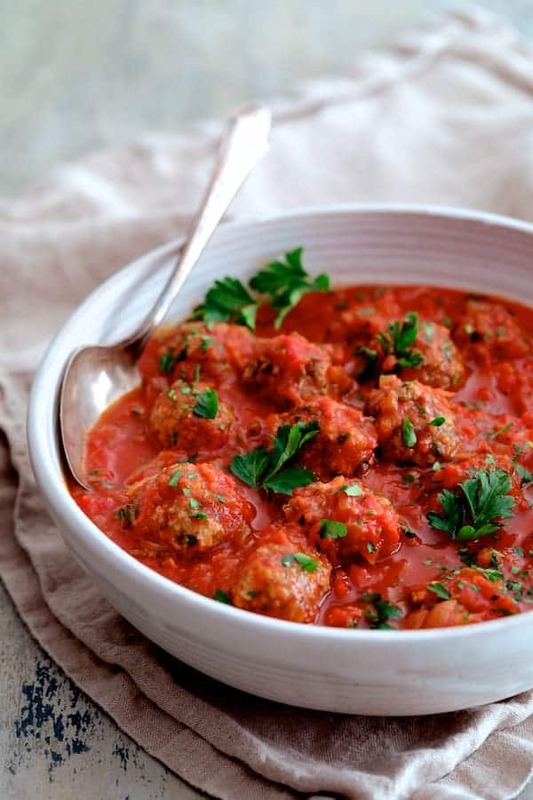 Spiced Meatballs in Tomato Sauce are a delicious twist on meatballs! They make a flavorful addition to your holiday table. It’s also Progressive Eats time, our virtual progressive dinner, so keep reading and grab some more great holiday dishes from my food blogger friends! Do you want to hear something sad? Besides turkey or ham at our family holiday table, my mother served venison meatballs. Now, turkey and ham are quite nice, but it ain’t a party until the meatballs show up! Because deer-hunting had just occurred at the end of November and my father is an avid deer hunter, our freezer was stocked with lots of venison for the winter. Which meant lots of venison meatballs! Now here’s the sad part. When I asked all of my sisters (that would be five!) if they remember how mom made her venison meatballs, they only had vague recollections. Now, here’s what’s even sadder. I put together an entire cookbook of family recipes 11 years ago so that precious family recipes were preserved. However, I forgot to include my mother’s venison meatballs! So, although these are not my mother’s amazing venison meatballs, these Spiced Meatballs in Tomato Sauce are pretty amazing! Mom used some spices which I’m sure included a touch of allspice. 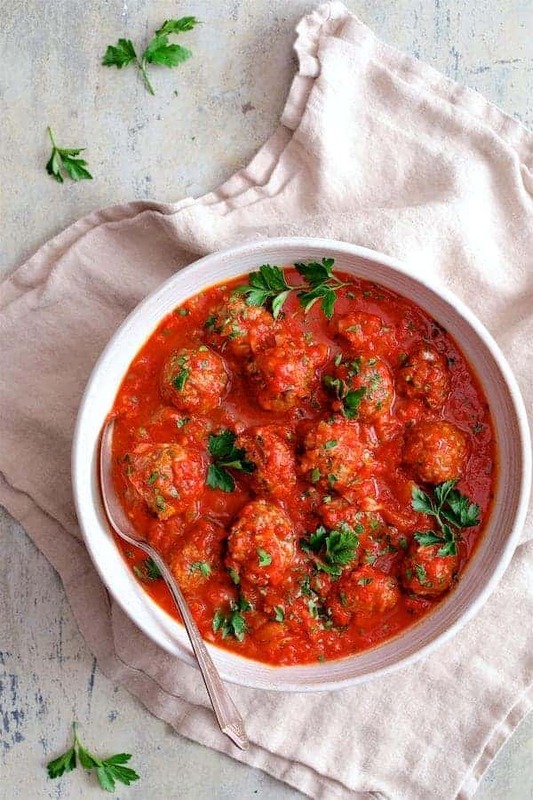 The spice combination in these Spiced Meatballs in Tomato Sauce is meant to mimic the one she probably used along with the lovely simple tomato sauce she made from the summer’s tomato harvest. Mom always fried her meatballs, but in this day and age, baking is the way to go! Combine all the ingredients except the meat in a large bowl. Then, add the meat and mix well. I put on disposable gloves and then mix with my hands. Using a cookie scoop, I portion into approximately 1-inch meatballs and place on parchment paper. 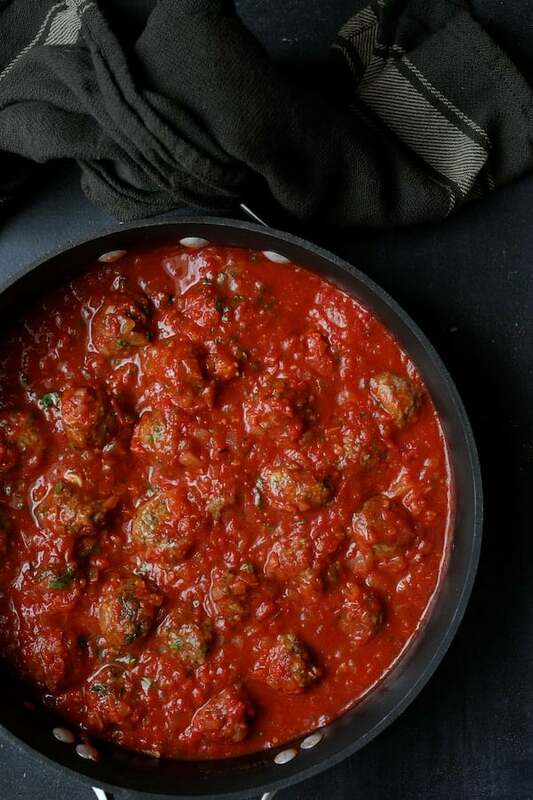 While the meatballs are baking, make the super simple tomato sauce. When the meatballs are finished baking…. Serve as an appetizer or serve as a main course over rice or orzo pasta. 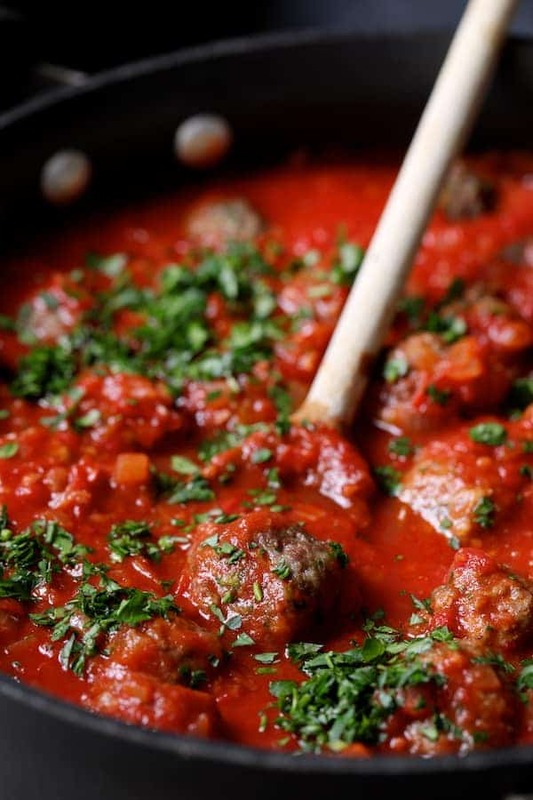 Spiced Meatballs in Tomato Sauce! Not so sad after all! It’s our virtual version of a Progressive Dinner Party. This month features old-fashioned holiday recipes–the ones we grew up with. 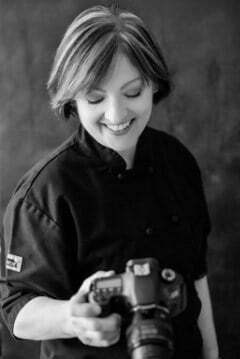 Our host this month is Liz from That Skinny Chick Can Bake. If you’re unfamiliar with the concept, a progressive dinner involves going from house to house, enjoying a different course at each location. With Progressive Eats, it’s a virtual party. A theme is chosen each month, members share recipes suitable for a delicious meal or party, and you can hop from blog to blog to check them out. Come along and see all of the delicious holiday dishes we’ve put together for you! 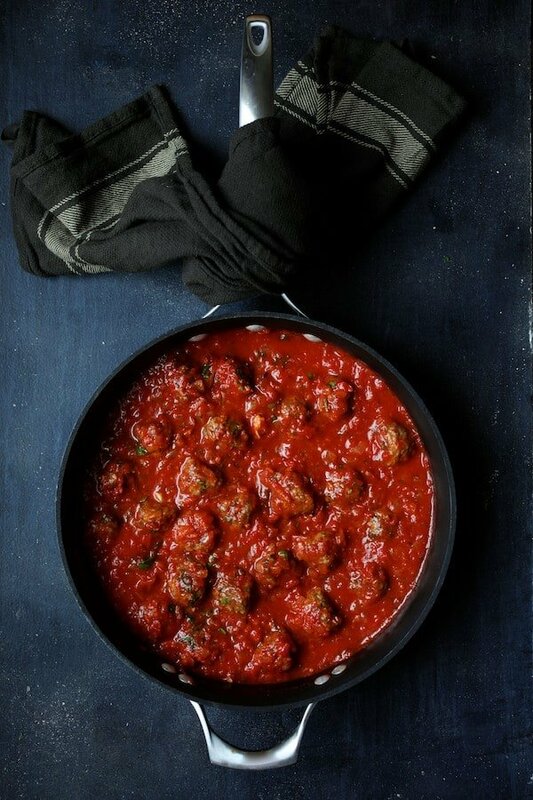 Spiced Meatballs in Tomato Sauce are a delicious twist on meatballs in a classic tomato sauce. They make a flavorful addition to your holiday table! 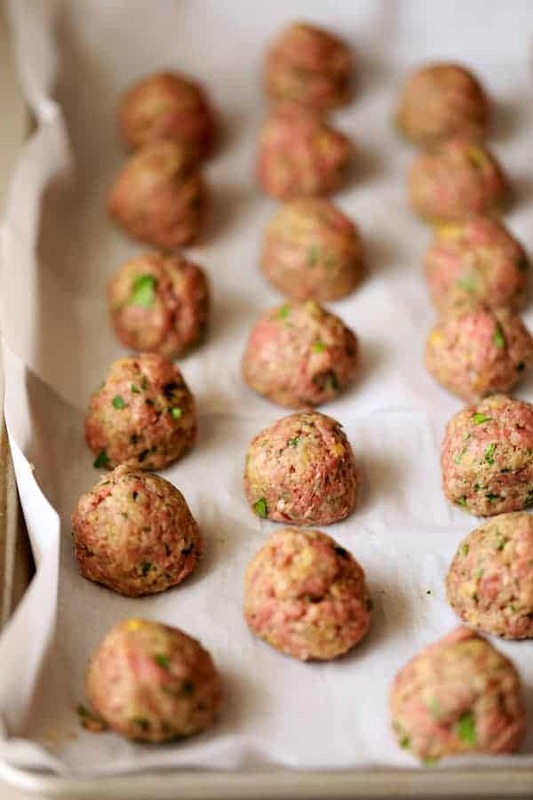 MEATBALLS: Preheat oven to 350 degrees. In a large bowl, combine panko, milk, eggs, garlic, parsley, coriancer, cumin, nutment, salt and black pepper and mix well. Add the ground meat (beef, venison or the combination) and mix well. 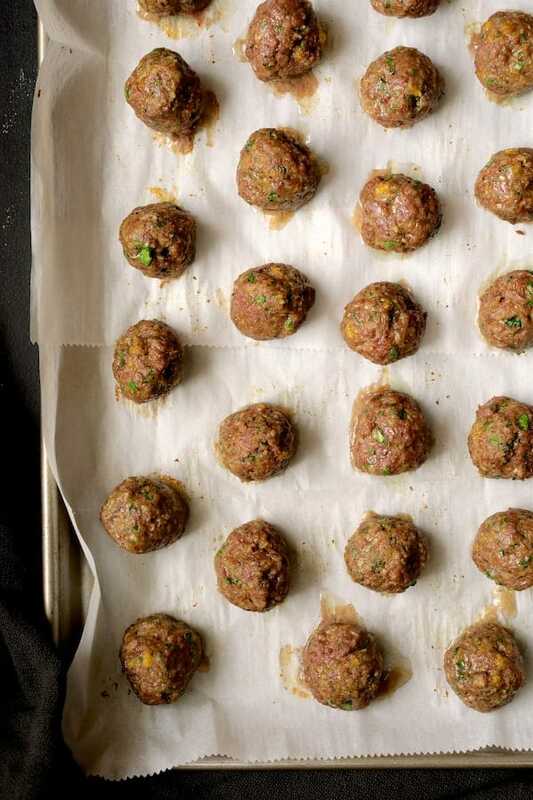 Form into 1-inch (approximately) meatballs and place on a parchment paper-lined baking sheet. Bake for 15-17 minutes or until a thermometer registers 165 degrees in the center. 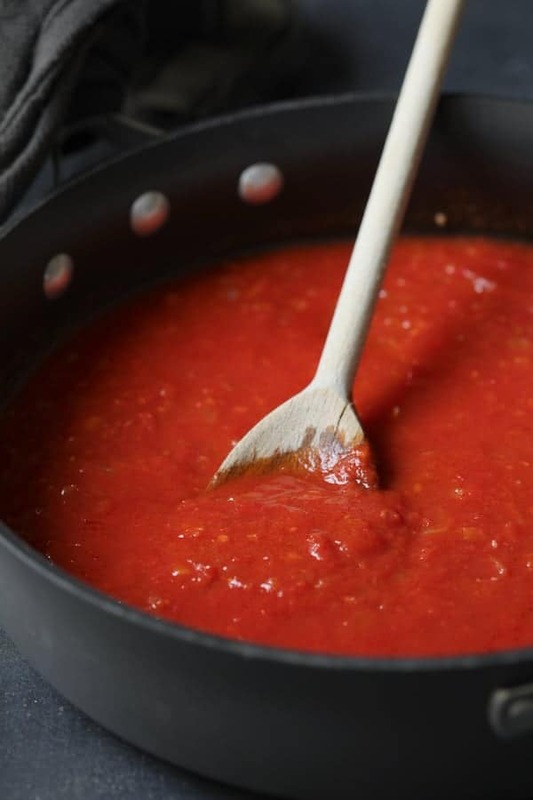 SAUCE: While the meatballs are baking, make the sauce. Heat olive oil oil in skillet or saute pan over medium-high heat. Add the onions and garlic. Reduce heat to medium-low and cook 7-8 minutes or until beginning to soften. Add the wine and tomatoes and simmer gently 15 minutes. Add the meatballs and continue simmering another 10 minutes. Add parsley and season to taste with salt and black pepper. Serve over cooked rice or orzo pasta. Thanks, Laura! Beef or lamb would also work well! A sad story with a very happy ending! These look great! These look amazing! I’m so happy you were able to recreate it, and honestly I’d rather have them than turkey any day. #notaturkeyfan Saving this recipe!! Thanks, Susan! Hope you enjoy! How fun that you were able to create a version similar to your mother’s meatballs. I’m sure your family appreciates your efforts. I love baking meatballs – it is so much easier and less messy, the perfect technique!! Thanks, Jane! There is definitely something therapeutic about both making and eating meatballs. They make anyone smile! Absolutely nothing sad about this at all. I’ll bet your version is just as good as mom’s; they sure look terrific to me. I should have visited after lunch…my tummy is growling! Thanks, Barb! Mom’s are just a memory but I know there’s nothing wrong with new traditions and memories! I’m always in the mood for meatballs! So glad you were able to recreate your mom’s recipe! They look fabulous! Thanks, Liz! Meatballs are definitely one of those things I can’t get enough of! So much fun!